Premium SPA varumärket Shangpree har lanserat sin premium rikliga modelleringsmask, en näringsmask med sitt eget oljesystem. Fuktgivande och närande mask med guld, honung och propolis som stärker och vitaliserar huden. Steg 4. - Låt den vara på i 30-40 minuter, sedan ta bort den. "Du kan lämna modelleringsmask i upp till 40 minuter eftersom 3 mm tjock av mask håller din hud från förångning och masken håller också hydratiserande själv en stund. 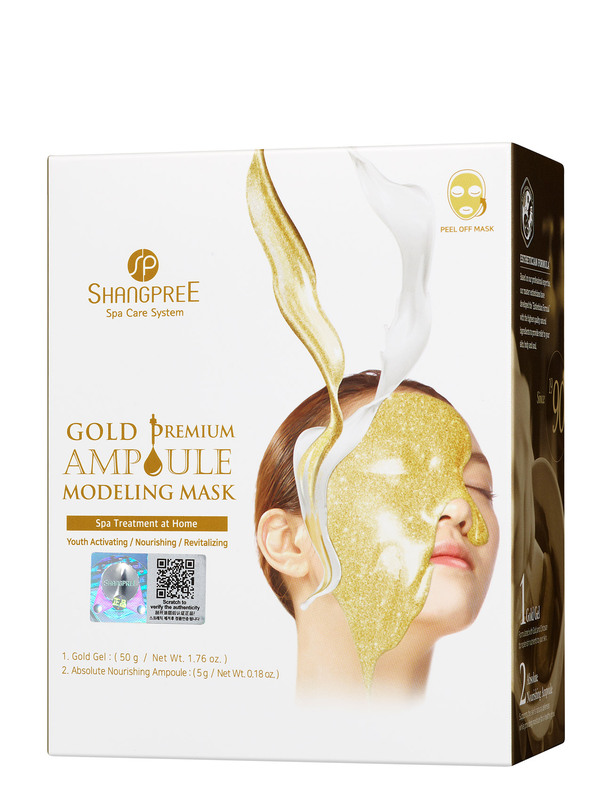 (GOLD GEL): Aqua, Glycerin, Sorbitol, Algin, Zea Mays (Corn) Starch, Glucose, Beeswax, PEG-75, Potassium Chloride, Titanium Dioxide, Mica, Iron Oxides, Glycyrrhiza Glabra Root Extract, Centella Asiatica Extract, Butylene Glycol, Zingiber Officinale (Ginger) Root Extract, Schizandra Chinesis Fruit Extract, Coptis Japonica Root Extract, Camellia Sinensis Leaf Extract, Propolis Wax, Caprylyl Glycol, 1,2-hexanediol, PEG-60 Hydrogenated Castor Oil, Adenosine, Chitosan, Betula Platyphylia Japonica Juice, Honey Extract, Aloe Barbadensis Leaf Extract, Sodium Chloride, Hydrolyzed Collagen, Simmondsia Chinensis (jojoba) Seed Oil, Vitis Vinifera (grape) Seed Oil, Scutellaria Baicalensis Root Extract, Adansonia Digitata Seed Extract, Cornus Officinalis Fruit Extract, Panthenol, Algae Extract, Cucumis Sativus (Cucumber) Fruit Extract, Portulaca Oleracea Extract, Plantago Asiatica Extract, Thuja Orientalis Extract, Chlorphenisin, Disodium EDTA, Gold (0,5 ppm), Fragrance. (ABSOLUTE NOURISHING AMPOULE): Aqua, Calcium Sulfate, Glycerin, Butylene Glycol, Zea Mays (Corn) Starch, Potassium Cloride, Glycyrrhiza Glabra (Licorice) Root Extract, Centella Asiatica Extract, Zingiber Officinale (Ginger) Root Extract, Schizandra Chinensis Fruit Extract, Coptis Japonica Root Extract, Camellia Sinensis Leaf Extract, Propolis Wax, Caprylyl Glycol, 1,2-Hexanediol, PEG-60 Hydrogenated Castor Oil, Simmondsia Chinensis (Jojoba) Seed Oil, Macademia Integrifolia Seed Oil, Cyamopsis Tetragonoloba (Guar) Gum, Cellulose Gum, Microcrystalline Cellulose, Hydrolyzed Collagen, Achillea Millefolium Extract, Artemisia Absinthium Extract, Arnica Montana Flower Extract, Aloe Barbadensis Leaf Juice Powder, Cornus Officinalis Fruit Extract, Camellia Japonica Flower Extract, Magnolia Kobus Bark Extract, Houttuynia Cordata Extract, Silybum Marianum Extract, Phellinus Linteus Extract, Panax Ginseng Root Extract, Propolis Extract, Sodium Hyaluronate, Allantoin, Chlorphenesin, Fragrance.